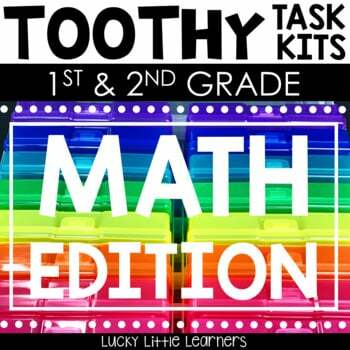 Toothy™ Task Kits- an original idea from Angie Olson at ©Lucky Little Learners, LLC. 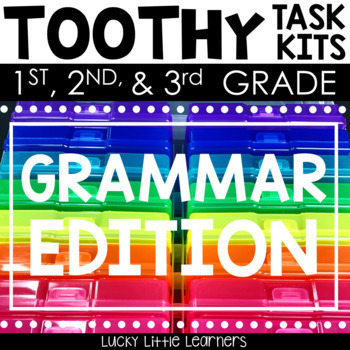 Toothy Task Kits are a great option for your students as centers, early finishers, or even morning work. The Toothy mats make these activities highly engaging! 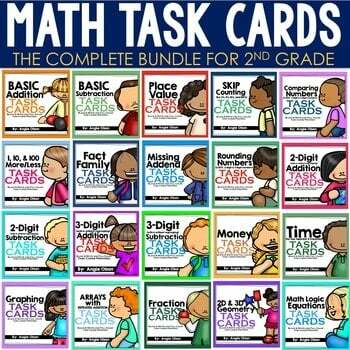 The answers on the back of the cards allow for these activities to be self-paced and self-correcting. Each partner gets a Toothy mat and dry erase marker. Students will take turns choosing a card. 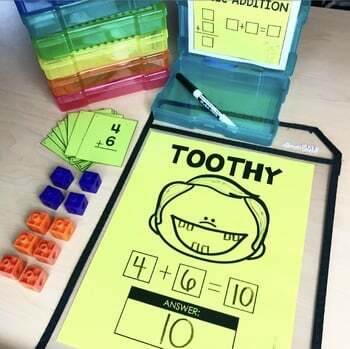 Each student who is playing the game will solve the problem on their Toothy mat or dry erase board. When all who are playing have answered the question, they compare their answers and then turn the card over to check to see if their answer is correct. 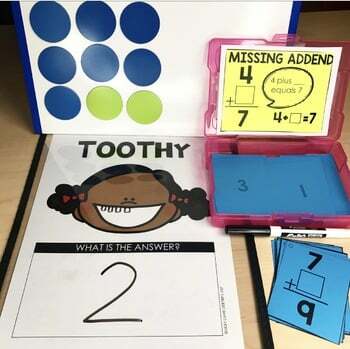 Those who have a correct answer get to draw a tooth in Toothy’s mouth on their mat. If the student’s answer is incorrect, they do not draw a tooth and those who got the answer correct must explain how they got to the correct answer. Then the next student draws the next card and the process is repeated. The game is over once all 27 cards have been answered. 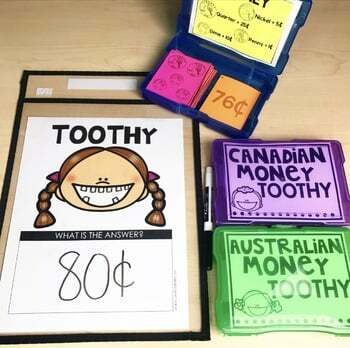 The student with the most teeth in Toothy’s mouth is the winner of the game. ►SIGN UP to receive weekly email freebies! ►FOLLOW me on Teachers Pay Teachers! ►FOLLOW the Lucky Little Learners Blog! Copyright © Lucky Little Learners, LLC. All rights reserved by author. Permission to copy for single classroom use only. Electronic distribution limited to single classroom use only. 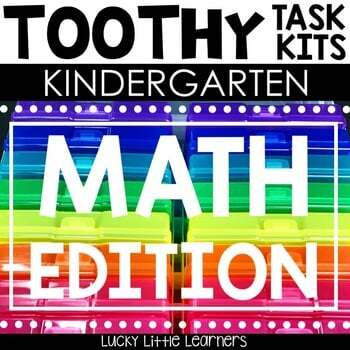 If you have any questions about this resource, please contact me at customerservice@luckylittlelearners.com. Sign up below to get the weekly email freebies! 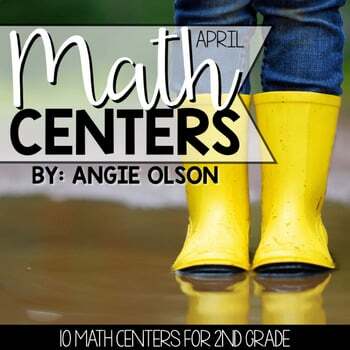 My name is Angie Olson and I am the teacher, author, and curriculum designer behind Lucky Little Learners. I created Lucky Little Learners as a way to connect with other teachers around the world. 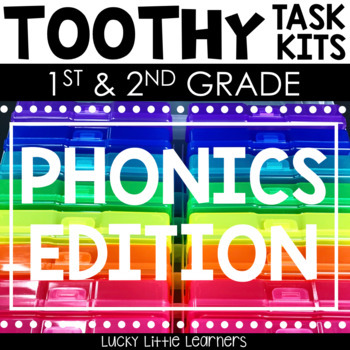 I develop lesson plans, printables, centers, interactive notebooks, activities, and resources for other teachers.